Gregg and I run an AirBnB in our home and absolutely love it. We don’t have a fancy, large home. Our home is about 1600 sq feet. Our guest has given us some of the highest ratings and it isn’t because they are staying at the Ritz. It is because they arrive and feel loved and cared for. They walk through the door and we strive to make them feel welcomed. I think one of the main reasons we get such good results is because we invite the guest to have breakfast with us each morning. We serve a good variety of food choices each morning. 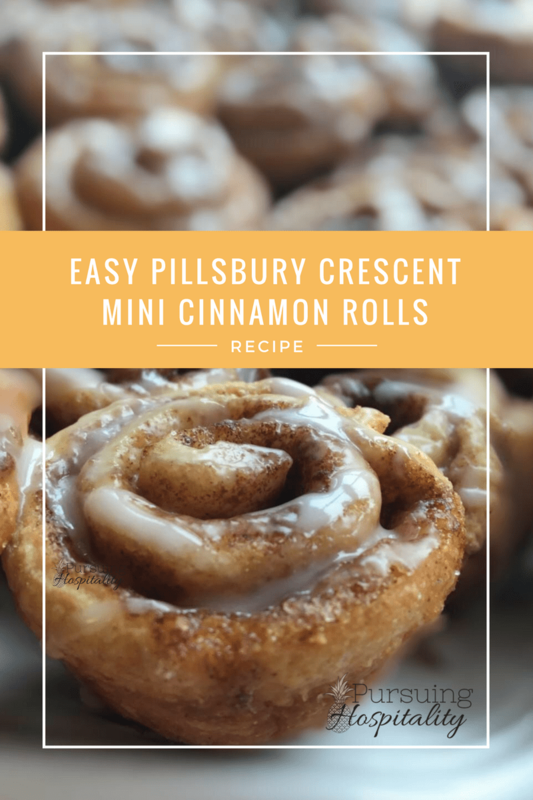 This Pillsbury Crescent Mini Cinnamon Rolls Recipe is a treat that I do for each one of the guests. These easy Pillsbury Cresent Mini Cinnamon Rolls are what we would call Semi-Homemade. They are made with the Pillsbury Cresent Sheets. I fell in love with this product and use it for so many things. The Pillsbury Cresent Mini Cinnamon Rolls Recipe is the top on my list. What makes this Semi-homemade is because you are using store bought Pillsbury Cresent seamless sheet. Everything else that you do makes it homemade. So feel great about yourself when you pull out these amazing easy Pillsbury Crescent Mini Cinnamon Rolls. You will be the superstar baker and won’t have hours of prep time. Preheat oven according to Pillsbury Crescent Dough Sheet instructions. Roll out dough onto lightly floured surface. Sprinkle cinnamon over the dough. Use the amount that you desire. Sprinkle brown sugar over the dough. Use the amount that you desire. I use 1/2 cup and then sprinkle a little on top once rolled and placed in the mini muffin pan. From the long side of the dough, roll the dough. Pinch the edge across the long side to seal. Grease the mini muffin pan with melted butter. Use generously. Slice roll with a segregated knife into 1/2 inch slices. Place one slice into each muffin cup. Cook for 8 -10 minutes. Watch to make sure they do not brown too much. Remove cinnamon rolls immediately from the muffin tins and place on a cooling rack. Once the rolls are cool, drizzle icing over the Mini Cinnamon Rolls. Place powder sugar in a bowl. Mix milk or water with powder sugar. If mixture seems too thick, add small drops of liquid until the icing gets to a point that it streams off your spoon smoothly. If you want to get adventurous and add a wonderful flavor to your icing, add 1 tbsp of maple syrup to your icing. This smells and tastes AMAZING. These Pillsbury Cresent Mini Cinnamon Rolls will impress your family, guest or moms group. They are first off, SO CUTE! The tiny cinnamon rolls are fun to eat. They are also easy to eat. So I encourage you to try them soon. I love serving these as well when we have children in the home. Little fingers can handle these and not make a mess. Hopefully, you will tuck this semi-homemade recipe into your favorite breakfast Pinterest board. 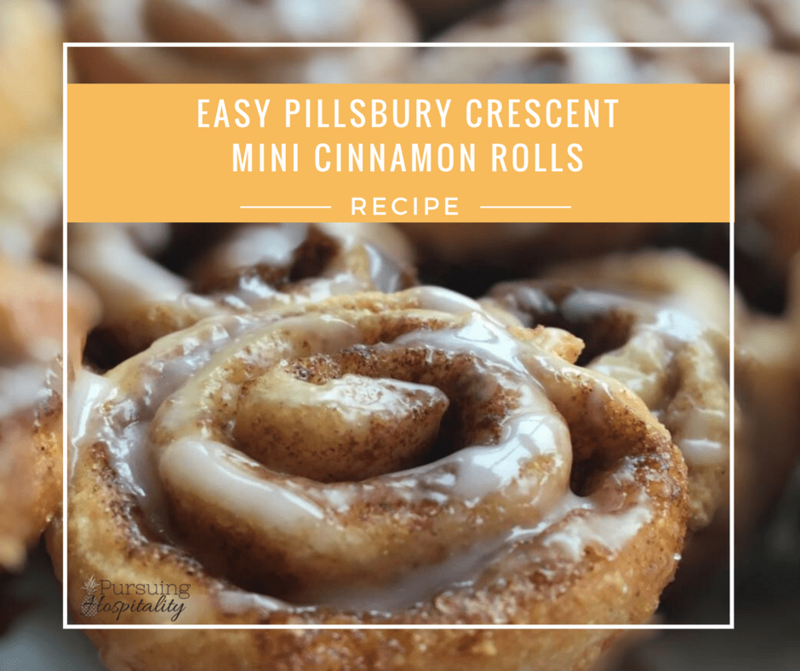 Also if you need a recipe that goes great with these Pillsbury Crescent Mini Cinnamon Rolls Recipe, here is my Easy Breakfast Casserole.